Vital card, this is one the most iconic of all Babe Ruth cards. Issued in only his third season as a Yankee, this is a revered card that is the key to one of the truly classic pre-war baseball card sets. As with other Ruth cards, these have exploding in price in recent years. The offered card is a terrific VG, there are no visible creases or wrinkles, even under magnification. The image is perfect, the back is clean, the surfaces as well. The corners exhibit mild and consistent wear, this is centered mildly to the right border. This card has an unusual image of Babe Ruth that is used on hardly any other cards. Please note these are at least 20 times scarcer than his 1933 Goudey cards in comparable grades. 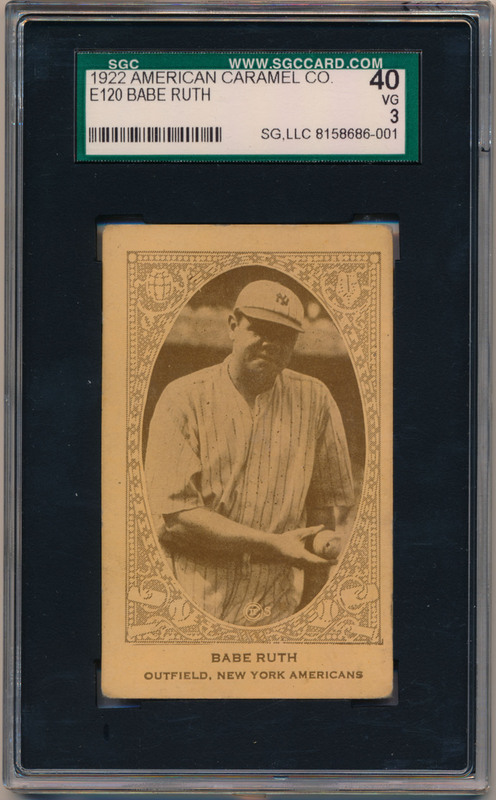 It will be interesting to see where this terrific Babe Ruth card trades at in a few years.